But they are something that developers use, right? Why should everyone care about them so much? Which is better react JS or react native? Well, the way these technologies are designed is of everyone’s interest! Especially, the clients. If you own a website or a mobile app or are thinking of getting either of them any time soon, you need to know that the era of substandard mobile apps and websites is long over. 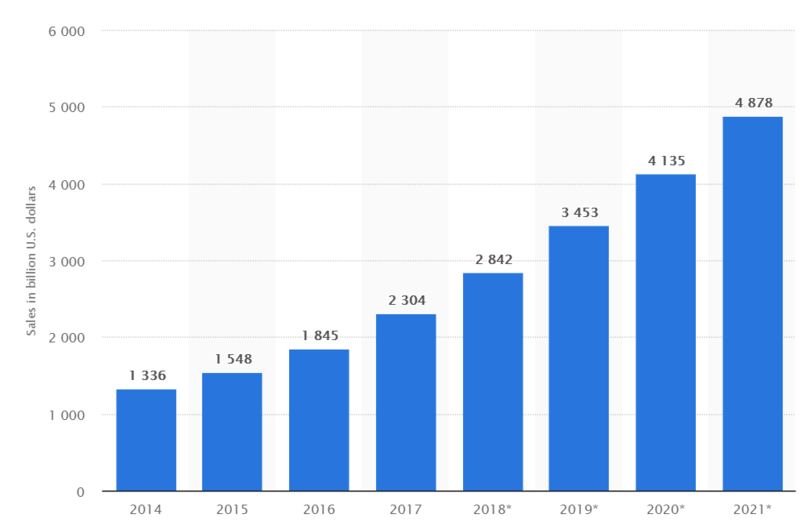 Online shopping and e-commerce sales in 2017 amounted to a whopping $2.3 Trillion and is expected to double by 2021, as shown by Statista. Most of this revenue is generated via mobile apps and websites. 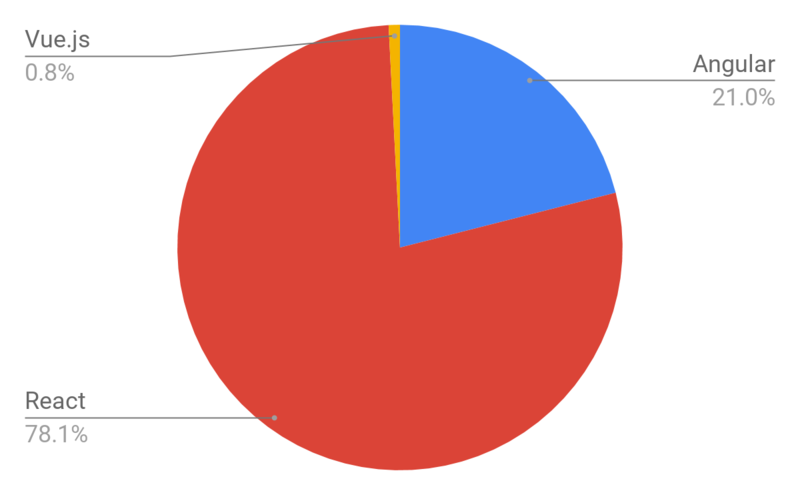 This is where React JS and React Native come into the picture. Both of these technologies are made to supercharge the next generation of digital properties. But there is quite some difference between the two. React JS and React Native although have very similar names, they don’t mean the same thing. In this article, we would clear the confusion of their names and also tell you why they’re so hyped. Facebook specifically built it to make Facebook.com more agile and adaptable to the latest use cases before open-sourcing it. React JS currently powers some of the biggest websites on the internet and provides the competitive advantage in loading time, SEO and performance on websites. As said, react has been highly popular in the market since long and has comprehensively competed with Vue JS, Angular 2 JS, and Angular JS. 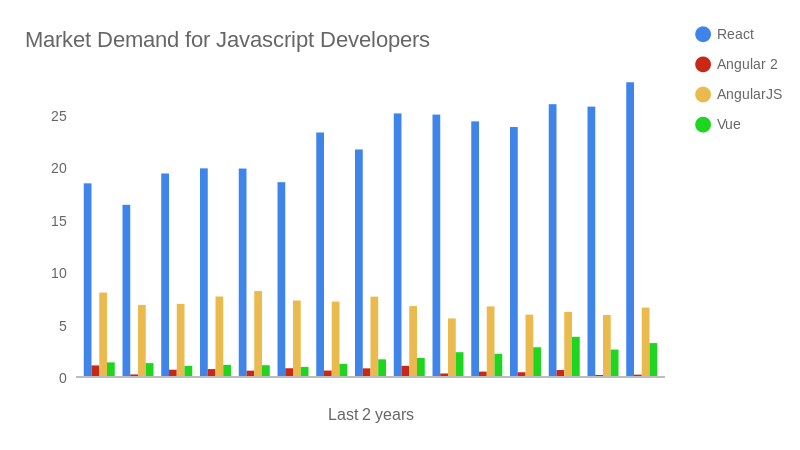 In an analysis of the Indeed.com which is a job listing website, it was found that the demand for React js developers was the highest, as given below. Unlike other frameworks, Learning of React JS is quite easy as it seamlessly works in tandem with the MVP apparatus, and only requires HTML knowledge to implement. Lower react native tutorial curve means you can quickly train your developers to React and start building React components into websites. This also saves time in developing the application and making it ready for production. Facebook is now distributing the framework with an open source license which is great news for web development companies around the world. You can use the framework without having to take permissions or paying a premium to Facebook for the same. 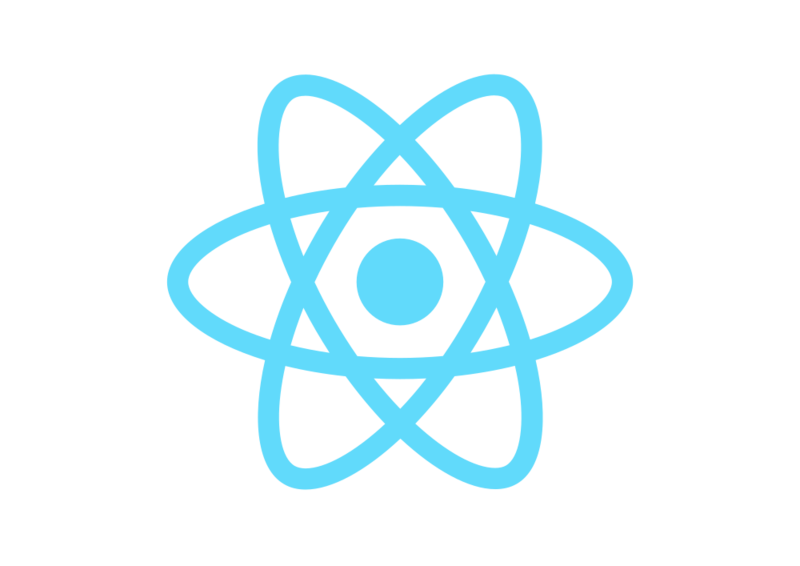 The React JS website and React repository on Github will help you get started with React free of cost. The well-maintained React JS documentation and community support also help in building high-performance websites. In addition, Facebook provides something called “codemods” which further help you migrate between React Native upgrades quite easily. So far we know that React JS powers websites and light-weight web apps for User Interface enhancement. React JS can extend to mobile apps as well, but with compromises. In order to resolve those compromises, we have React Native for mobile application development that has built-in tools and support for mobile apps. Let’s go over React Native! It has been designed to seamlessly work with Objective C and Java wherever required, which allows is to integrate React JS features into native code. This way, react native app developers can switch to native code whenever they want to use device-specific features or use the React code to make the application otherwise. This way, React Native makes up for a mobile apps technology that is great for businesses wanting a cheaper and faster mobile app development. React Native has been on a high since some time and the Google Trends chart shows the same. The React Native’s Github repository statistics show that 1002 contributors have committed 15,547 times in 99 branches with 292 releases. React Native is also the 14th most starred repository on Github. This enables you to extract a number of benefits from the technique. We are a bunch of experienced react native developers, and we’d like to tell you a few reasons how you can save resources and speed up development using React Native. If you’re planning to launch your apps in React Native, you’d be able to publish them on both Google Play Store and Apple App Store without having to recode them all together again. 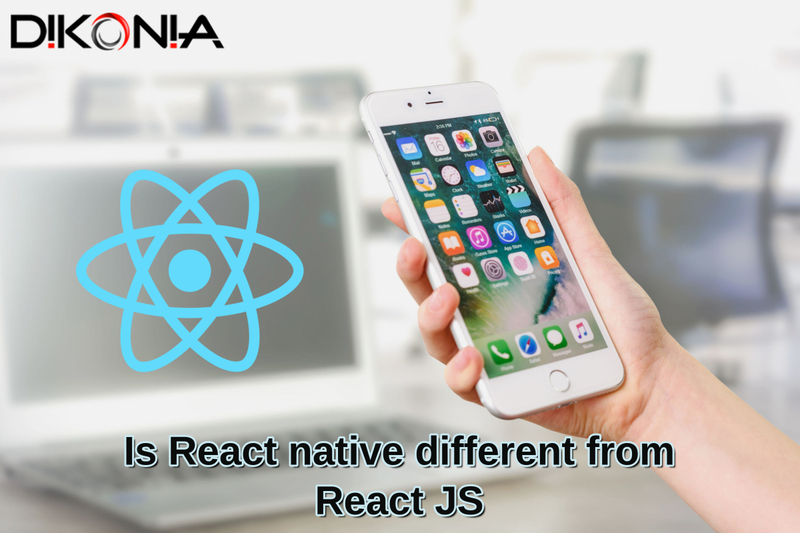 Hence, the React Native developers wouldn’t need to code in OS specific languages and using just one code base, the app can be suited to two different platforms. The complexity of the app further depends upon your use case but the combined time to develop two apps is reduced. Business Benefit – This saves you the time and resources required for building two apps for two platforms. Development costs are reduced and you can increase the speed of development, getting your app faster from wireframe to market. 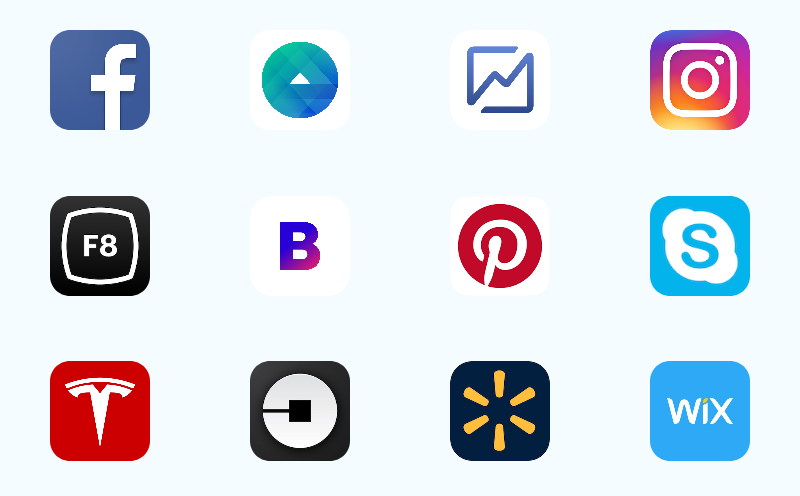 Business Benefit – For Startups looking to build an app for promoting their business directly, React Native can be a nice asset. If you’re an e-commerce vendor, Food Delivery App, Chat/Messenger App, Customer Experience App etc – apps that don’t have too many things going on in them, as seen in the popular app Pokemon Go App, you can get much better performance with your money. If you ask React Native developers, what’s the best part of using the technology, they’d say that they can use it in pre-built apps as well. 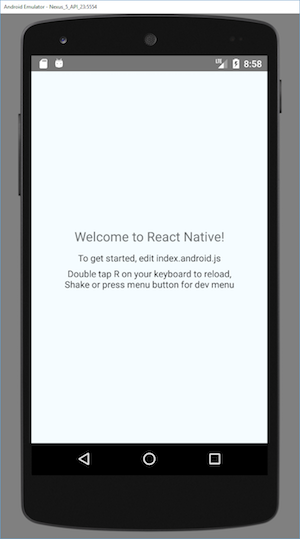 Basically, if you have an app that was built in some other hybrid framework such as Ionic etc, you can use React Native to upgrade the app’s UI without converting the whole app to React Native. This is a great advantage over any other mobile development technique as it saves a lot of developer’s time and effort while redesigning of the app. You will need redesign from time to time and using React Native, it just becomes easier to do so. Business Benefit – Redesign your existing app with React Native and get better performance without making a new app altogether. One of the most unique features of apps in React Native, is that they fuse directly with Native code. This further improves app delivery times as the testing procedures and debugging becomes faster. Native apps are known for their slow QA times and using React Native, you save yourself from that hassle. Benefits – Make even lesser compromises on the features you usually can’t use in Hybrid App Development. Since its release, React Native has been experiencing some strong community support for React Apps for Startups. It’s one of the most popular language on Github and Stack Exchange, backed by a thriving community of React Native experienced developers who are constantly working together to improve it. Then there’s support from Facebook developers in maintaining the app base and improvise it further after the overwhelming response it has received. This ensures a great deal of confidence as a framework to choose for your next app! Business Benefit – Easier to find resolutions for technical problems. Better scope for experimentation and finding solutions to the logical anomalies that may exist in business use case. Dikonia recently added React Native to its offered mobile development technologies, considering the number of advantages it has. Our React JS developers have received professional training to work with React Native. We completed a number of projects from Australia, USA, and New Zealand, in the form of mobile apps built with React Native. The app constitutes iOS App, Wed admin, Laraval, Sendgrid, AWS Load Balancing, Paypal payment gateway, Push Notifications. 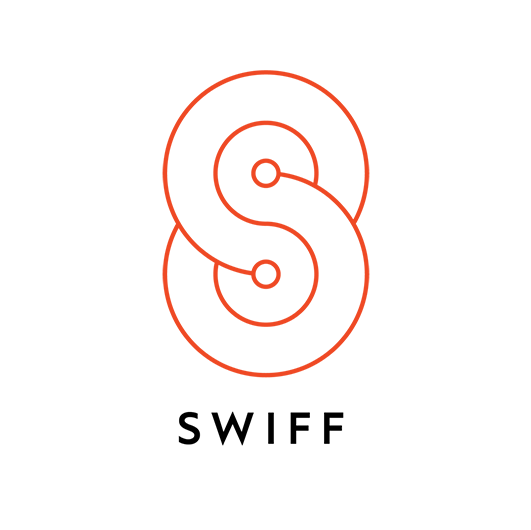 Swiff is a New Zealand based mobile marketplace app for services. The main objective of the app is to help users find businesses in their area in real time. Users can easily connect with professionals who are providing business services. The app constitutes AWS and React Native framework. WorkFeed is a platform which brings together businesses and direct users. The main objective of this application is for trades businesses to manage their online presence in order to get the right customer enquiries. Individual jobs can be posted from WorkFeed mobile app and people can easily find trades by searching for relevant work completed in nearby areas through the website. The app is available in both React Native Android and iOS versions. 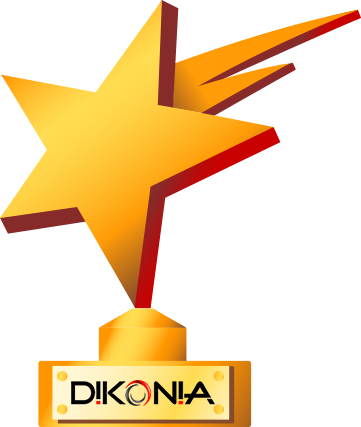 Dikonia houses React Native developers with lot of hands-on project experience to help you create React app for your new Startup. We recently helped three startups to launch their apps in the market and shoot off their Business. Contact us to discuss your requirements and let’s make you a React Native app too!